Dragon comes from the Greek word meaning “to see.” This dragon’s eyes peer into the future, a watchful beast. He once protected a royal female entourage as they sailed after death, deep into the mythical waters of Midgard, the Otherworld. 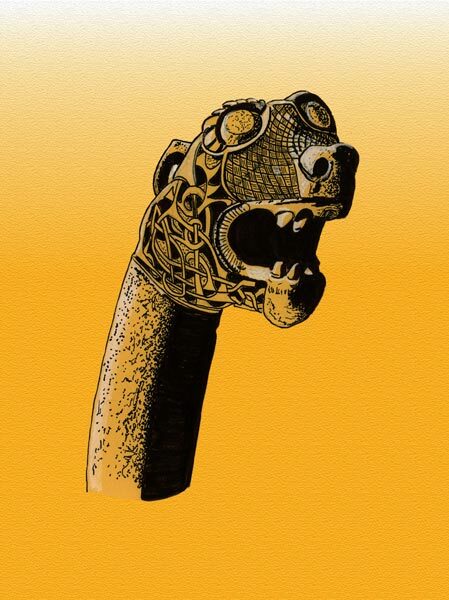 About 850 CE this seventy-foot-long wooden ship was buried on the west coast of Norway, Oseberg and this carved oak dragon’s head decorated its prow. Rather than be consumed by this fearful beast’s breath, allow it to rejuvenate you. Fear is just a perspective. What fears do you face? How might “dragon” protect you as you travel? What does your group face in the “Otherworld?” Think about “fear” and “fire.” What is burning within your collective capacities? Yellow: like this dragon, and fire, yellow rises up to destroy and transform, if allow ourselves “to see.” The yellow chakra in our bellies, may very well be, as the Cherokee Indians teach, the sacred fire of wisdom.